Save Money, Save Time, & Get The Job Done Right! For anyone who’s ever wanted to mend their own clothes, but were afraid to try, I have a simple message… If you’re worried about tackling home sewing, don’t be! This professionally produced, high quality sewing DVD is the answer for anyone wanting to learn how to finally put their home sewing machine to work. Professionally produced sewing tutorials available for download. 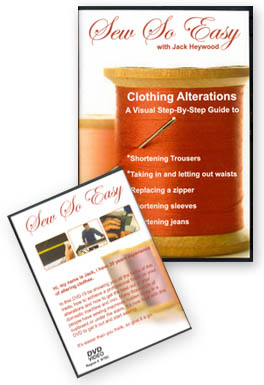 A range of professional written informative sewing guides explaining many different subjects relating to sewing and sewing techniques. If you’re worried about tackling home sewing, don’t be! There’s no big, dark secret to successful tailoring and making professional looking alterations. If you have even a basic, no frills sewing machine, I’ll show you – step by step – the techniques and tricks of the trade of doing perfect alterations at home. It’s easy, its straightforward, and even better… its fun! I’m Jack Heywood, and I’m a professional clothing alterations expert – having been in the business of tailoring clothes for well over 30 years. I’ve pretty much done it all when it comes to the art of taking in hems, taking out trousers, shortening sleeves, replacing zippers & buttons… and everything in-between. As it says in the write-up. He is very calming and authoritative, he is very good at teaching. Having only a basic knowledge of sewing by machine I found this DVD easy to follow with every step clearly illustrated. I would recommend this DVD to anyone who has the ability, but not the know how. I look forward to obtaining future DVD's from the people who produced this.